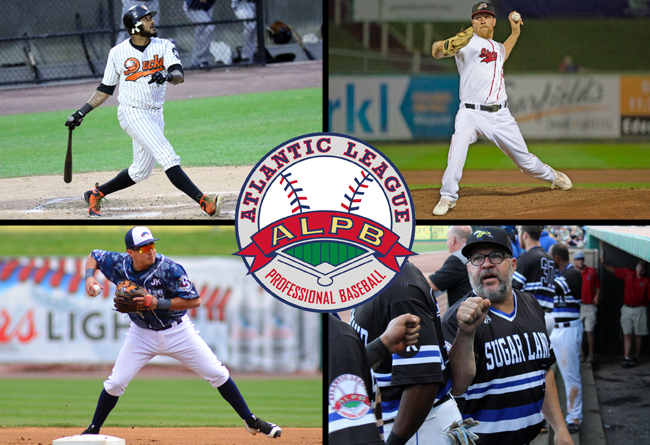 (Lancaster, Pa., Oct. 11, 2018) – The Atlantic League of Professional Baseball today announced the recipients of four 2018 post-season awards, including the league’s Player of the Year, Pitcher of the Year, Rawlings Gold Glove Defensive Player of the Year and Manager of the Year. Results were based upon voting from league executives and club managers. Long Island Ducks infielder Jordany Valdespin has been named the Atlantic League’s Player of the Year. The four-year Major League veteran led the Atlantic League with 154 hits, 94 runs scored and seven triples during the 2018 season while ranking second in batting average, just .0007 behind the league leader. Valdespin was also among the league’s Top 5 in several other categories, finishing second in on-base percentage (.399) and total bases (222), third in stolen base percentage (.857) and fifth in slugging percentage (.487). Additionally, he posted the longest on-base streak in the league this past season at 32 consecutive games from June 4th to July 14th. The 30-year-old was selected to play in the Atlantic League All-Star Game and was named the league’s Co-Player of the Month for April/May. Valdespin was also chosen as the league’s Post-Season All-Star second baseman earlier this week.